Last week, we looked at a few fantasy football players who have seen their ADP drop precipitously from the 2017 season. Today, I wanted to take a similar approach, looking at some fantasy options I felt the fantasy community has been over-thinking. Specifically, we’re looking at players who ranked highly in fantasy points per game in 2017 but whose 2018 ADP is significantly lower than where they ranked last year. Notes: For ADP, we’ll be using FantasyFootballCalculator.com’s PPR ADP. The numbers in parentheses below a player’s name represent their 2017 fantasy point per game positional rank vs. 2018 ADP (positional rank). These players are sorted in descending order by this differential. Montgomery averages 31.3 snaps per game and 10.9 fantasy points per game over the past two seasons, but a large bulk of this stretch is skewed by injuries. If we only include games Montgomery played on more than a third of the team’s snaps, he averages 15.9 fantasy points per game. For perspective, this would have ranked 10th-best at the position last year. Of course, Montgomery now has to contend with more competition for carries, but he should be cemented as the team’s primary scatback. With Green Bay likely to improve on last year’s results with a healthy Aaron Rodgers back under center, Montgomery is a safe bet to beat current ADP and has a good deal of upside to go along with it. Shepard finished 20th among wide receivers in fantasy points per game last year, but volume is unlikely to be anywhere near as good this year. Last season, Odell Beckham Jr. and Brandon Marshall missed a combined 23 games. The Giants are also unlikely to be as pass-heavy as they were last season (62.0 percent, fourth-most) after spending the No. 2 overall pick on Saquon Barkley, who is also a very capable pass-catcher. Shepard is a fine pick in current drafts, but I prefer some of the other names going within five spots of him (Kelvin Benjamin and Pierre Garcon). Last season, Johnson averaged 13.8 fantasy points per game (ranking 14th) despite averaging only 5.1 carries per game. He graded out seventh-best of 58 qualifying running backs last season and holds three of PFF’s top-15 seasons in receiving missed tackles forced by running backs (since we started tracking this data in 2007). After signing a three-year extension this offseason, he’s cemented as the team’s primary scatback on passing downs but lacks upside and week-to-week consistency with Carlos Hyde (and maybe also Nick Chubb) dominating early-down work. Still, he’s a value at current ADP. Perhaps more than any other wide receiver, Woods might the most glaring value by current ADP. He graded out 12th-best among 116 qualifying wide receivers and ranked 17th in fantasy points per game (13.8). Or, over his last 11 games (including postseason), he averaged 16.1 fantasy points per game, which would have ranked eighth-most if over a full season. Unless you think the difference between Sammy Watkins and Brandin Cooks is worth a demotion from the WR2 range to the WR4 range — which I don’t — Woods is another easy value. Thompson ranked 10th at the position in fantasy points per game last season, despite ranking outside of the top-40 in touches per game. His efficiency numbers last year are due for a regression but it’s interesting to note his ADP has barely budged following a season-ending injury to Derrius Guice. Volume could improve given the uncertainty surrounding these early down runners. Thompson graded out 13th-best at the position last year, while all of Samaje Perine, Rob Kelley, and Adrian Peterson graded out below average. Like the other scatbacks mentioned, he lacks upside and week-to-week consistency, but he’s still one of the safest running back values at current ADP. Ingram’s price has plummeted following a four-game suspension as well as a declining workload toward the end of last season. He will return from his suspension in Week 5 against Washington, then have a week off with New Orleans on bye, and then face off against three consecutive tough matchups in Baltimore, Minnesota, and the Rams. That being said, he’s finished seventh, 10th, and sixth at the position in fantasy points per game over the past three seasons. As it currently stands, he’s only appropriately priced, rather than a glaring value. Though, if I were in a league with weaker competition or six or more teams made the playoffs in my league, I’d be more willing to draft him. I suspect Smith to regress following a career-high in fantasy points per game (20.1) and passer rating (104.7), but I don’t think the landing spot (to Washington) and inevitable regression are as damaging as many expect. Going backward over the past five seasons, Jay Gruden’s starting quarterback has ranked fifth, fifth, 10th, 32nd, and third in total fantasy points (there was a lot of turnover at the quarterback position in 2014). Factor in a healthy offensive line and receiving corps and Smith is one of the safest picks you can make at the quarterback position this year. Funchess was wholly underwhelming to start his career but averaged a respectable 13.5 fantasy points per game after Kelvin Benjamin was traded to Buffalo, good for 23rd at the position over this stretch. Impressively, he did this despite running 35 percent of his routes against top-30-graded cornerbacks over this nine-week stretch (11th-most). Current ADP puts him at WR39, which is far enough away from his prior-year rank that he seems like a decent value. However, considering the arrival of D.J. Moore and the return of Greg Olsen he’s not someone I’m going out of my way to draft. 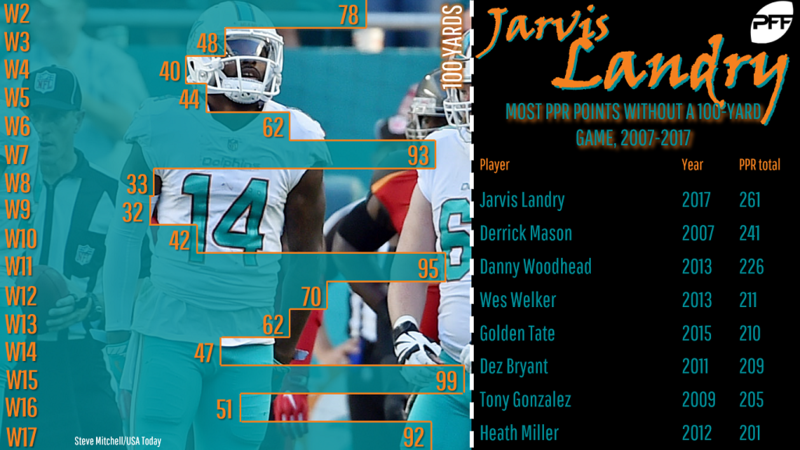 After finishing fourth, 13th, and 11th among wide receivers in fantasy points over the past three seasons, Landry feels like an easy value – and he is. I really don’t think the landing spot (to Cleveland) is as far from ideal as drafters are making it out to be. Cleveland ranks seventh (to Miami’s 25th) in passing plays per game over the past two seasons. Either Tyrod Taylor or Baker Mayfield should be a clear upgrade to Jay Cutler. Taylor and Landry have quickly established a strong rapport in camp, and as highlighted here, both Taylor and Mayfield are at their bests when targeting slot wide receivers. After wavering quite a bit on Jones in my rankings, I’m now confident he’s closer to who he was in 2017 this year than in 2016. At the very least, he’s a fine ADP value. Jones ranked 11th among wide receivers in total fantasy points last year. This level of production appears all the more impressive when considering his especially difficult cornerback schedule. Of 68 qualifying receivers, he ranked top-10 in percentage of routes lined up against (36 percent) and top-10 in percentage of targets in coverage against (30 percent) top-30-graded cornerbacks. Yes, Kenny Golladay has received a ton of offseason hype, but following the departure of tight end Eric Ebron (86 targets last year), there’s room for three wide receivers to return value. Unlike current drafters (it seems), I’m willing to completely throw out Agholor’s first two seasons in the NFL. Agholor was our single-worst-graded wide receiver in both 2015 and 2016 but finished 24th-best last season. What changed? Mainly, Agholor reverted back to his more natural position in the slot. Agholor ran 52.3 percent of his routes from the slot in his final year of college (2014) and 86 percent last year, but just 20.5 percent during his first two years in the league. Agholor offers decent safety, after finishing 28th in fantasy points per game (12.1) last year, and especially relative to his price (WR40). While the health of Carson Wentz is a concern, hopefully this is offset by increased volume during the (at least) two weeks Alshon Jeffery is sidelined due to injury. Okay, this one is easy. Every year we think this is the year Fitzgerald hits a wall, and every year Fitzgerald smashes his ADP. Fitzgerald ranks fifth, seventh, and ninth among wide receivers in fantasy points over the past three seasons, well above his current ADP. Yes, there’s a new offensive playcaller and new quarterback in Arizona, but I’m not sure it matters. Sam Bradford has targeted slot wide receivers (where Fitzgerald ran 62.0 percent of his routes last year) on 24.8 percent of his aimed throws since entering the league, or fourth-most over this stretch. Keep in mind, Arizona has lost 271 targets this offseason and, outside of running back David Johnson, Fitzgerald is the only other active player on the roster with 35 or more receptions in a single season.